Camden Town station on the Northern Line of the London Underground is one of the most congested stations on the network. It finally looks like something is happening to ease the problems as this consultation is now on the TfL website. TfL’s first rebuilding plans are described in Wikipedia and they needed a lot of demolition. Wikipedia says this. Apart from complaints about destruction of one of the ox-blood tiled station buildings, there is a significant controversy over the demolition of the buildings to the north. Complaints particularly centred on London Underground’s desire to replace the buildings with modern construction said to be out of place and out of scale with the remainder of Camden Town, together with complaints about the loss of the buildings and market themselves. This led to a public inquiry being held. In January 2004, consultants Arup published plans commissioned by Save Camden, a group of local market traders, for a remodelling that would preserve the majority of the threatened buildings, including the market. In 2005 Transport for London lost its appeal to the office of the Deputy Prime Minister and the scheme has been cancelled. So this has led to the current plan, where TfL are proposing a second entrance on Buck Street. They say this in the consultation. A possible site for a new station entrance would be on Buck Street, between Camden High Street and Kentish Town Road. It would lead to three new escalators and two lifts. Below ground there would be more space to change between trains. This would in turn enable future capacity benefits on the Northern line. The most significant point is the capacity upgrade on the line, which involves splitting the Northern Line into two. The Edgware Branch would take the Charing Cross route to Kennington before continuing to Battersea and eventually Clapham Junction. The High Barnet Branch would take the Bank route to Kennington and then go to Morden. The only thing stopping this is the current mess that is Camden Town. I would assume that this upgrade would include an easy walk-across for passengers changing between the two new lines at Camden Town. On the surface, it would appear that little will be done, except to build the new station entrance on the site of a closed school. This map shows the position of the new entrance. It would be ideally placed for the hoards of visitors going to and from Camden Lock and the various markets. It is also worth looking at the layout of lines in the area. Note how Camden Road station is actually quite close to the northern end of the platforms at Camden Town station. So would it be possible to create a better link between the two stations? I would certainly feel that when the Northern Line is split and extended to Battersea, many people would use the interchange. I certainly would, as getting to places like Charing Cross or Waterloo is one of those journeys you don’t start from Hackney. In Transport for London’s London Infrastructure Plan for 2050, this is said. This will allow, for example, higher frequency services out of terminals such as Victoria to South London centres such as Croydon and the development of major interchange hubs that act in a similar way to Clapham Junction in the South West. e.g. Camden Interchange between Camden Road and Camden Town stations. So obviously, TfL are thinking along these lines. The two stations are an official out-of-station interchange. A Google Map also shows Buck Street and the North London Line. Buck Street is the curved road in the bottom left corner of the map, just above the white building which is Camden Market. On the North side of the street is Hawley Infant and Nursery School, which will become the site of the second entrance to Camden Town station. The North London Line runs across the top of the map with Camden Road station at the right. It is worthwhile noting the fork in the line. The southern arm is a freight-only line, that leads to the disused Primrose Hill station and the Watford DC Line. The northern arm is the North London Line to Willesden Junction. At one time it was proposed that changes be made here, as detailed in Wikipedia, but nothing seems to be planned at the moment. The only thing the proposal shows is that TfL have been thinking hard about this area. But I do think that London’s universe-class tunnellers could create an escalator connection between the two stations, if that was decided how the interchange was to be created. There could also be other simpler ways to create better walking routes between Camden Road station and Buck Street. I will have to check, but I don’t think it is possible to walk along the tow-path of the Regent’s Canal. Later I took a train to Camden Road station and then walked by a roundabout route to Camden Town station. Do I have any conclusions and questions? The current walking route between the two stations is crowded and possibly dangerous. It also involves crossing two roads at lights. Because there is now steps down from Camden Road to the Regent’s Canal Tow Path, there is already a walking route between Camden Road station and Camden Lock, which does not mean any roads have to be crossed. Some improvements to the surface and perhaps guard and hand rails would need to be made to bring it up to a safe standard. It might be possible to install lifts, at Camden Road, Kentish Town Road and Camden Lock to make the tow path fully-accessible to all. 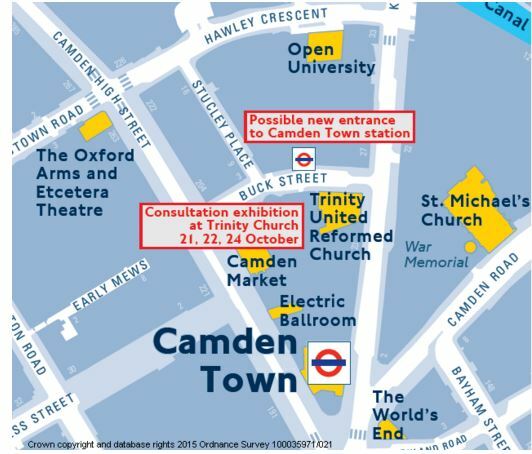 Until Camden Town station is extended and improved, it could be sign-posted as an alternative route to Camden Lock. As you approach Camden Lock, where the railway runs along the Regent’s Canal, what plans are there for development in the area? The Regent’s Canal Tow Path, would also enable a walking route between Camden Road station and the new Buck Street Entrance to Camden Town station. It would appear that the Hawley Infant and Nursery School is not a bad place for a second entrance to Camden Town station, as it is well placed for the attractions between Camden Town and Camden Lock. The Buck Street site is probably big enough to create a second entrance, which has a capacity substantially greater than the current station. The consultation talks of three new escalators and two lifts, but capacity is often determined by the space at the bottom of the lifts/escalators, which I’m sure would be more than adequate. The area round Camden Town station is more than incredibly busy. There are bus stops everywhere and they could do with being reorganised. As an example, getting a bus to London Zoo is not very easy. There are quite a few low-grade buildings in the area, that few would miss. How was planning permission for the Sainsbury’s supermarket obtained? Incidentally, the store was built in 1988, so it must be coming up for refurbishment soon. But looking at the North London Line as it passes over Camden Gardens and along the canal, it struck me that something dramatic and modern, but that still fitted in with the surroundings could be created that connected the high viaduct of the North London Line to the ground below and then by escalators and/or lifts to the Northern Line tunnels. 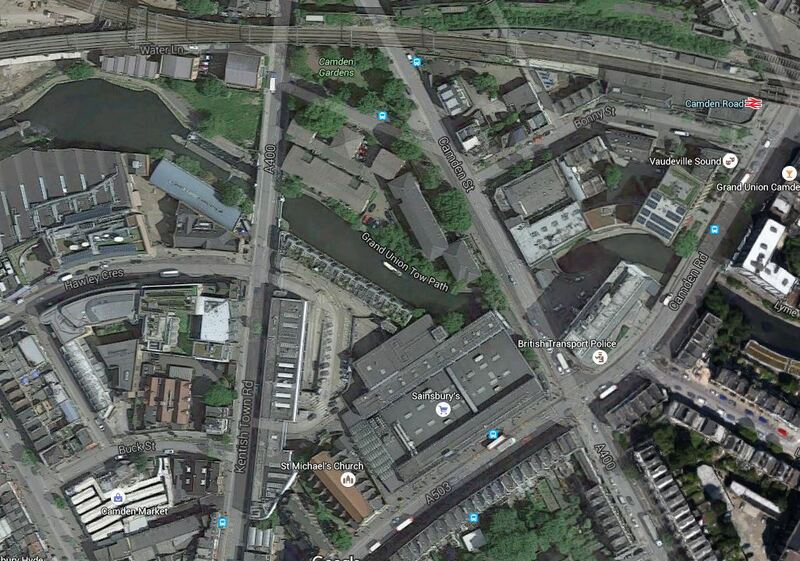 I then looked at the Google Map of the area from Camden Road station to Camden Gardens. Note the disused twin-track rail loop around Camden Road station to the north side of the station. There is also a smaller space on the south side that leads almost to Camden Gardens. Surely, an imaginative architect could use these resources to extend the station to the area of the gardens, from where some means of descending and ascending would be provided. Large lifts or escalators fully enclosed in glass would be something I’ve seen elsewhere and they would contrast well with the bricks of the viaduct. With my project management hat on, I also believe that TfL have chosen a design, that will be easy to build. Phase 1 – Build the second entrance with its lifts and escalators as almost a second station connected to the existing platforms. There is another station on the Underground that is effectively two stations – Knightsbridge, because of Harrods. Phase 2 – Open the second entrance and prove that it can handle all the passengers who want to use the station. Phase 3 – Close and refurbish the existing station. 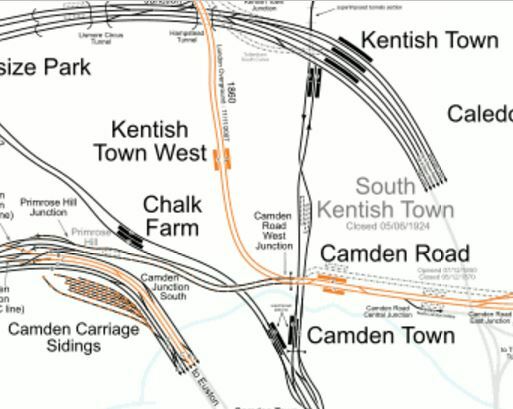 The link to Camden Road station would probably be incorporated into Phase 1. I don’t know anything about the safety arrangements of stations, but surely a twin station’s duplication must make it simpler. There is a chance to create an iconic Camden Interchange station, that truly reflects the unconventional nature of Camden Town.